Marsha, beautiful pairing of both Scripture & photo! This morning I will be thinking on the words "unfathomable" and "unsearchable". May we come to trust & rest in Him always. Blessings! Thank you for stopping by, Joanne! I find that pondering on his unfathomable and unsearchable ways continually draws me to Him. His mercies are new every morning. His wisdom and knowledge...we will never plumb the depths of Him. 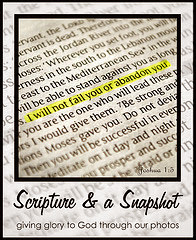 Love the Scripture and photo together! Thank you for a beautiful Sabbath blessing - Amen.